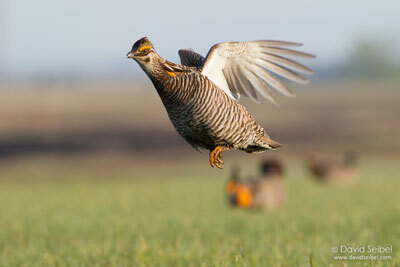 Description:A medium sized, plump looking prairie grouse colored in brown, white, black, buff and cream. Two tufts of feathers along each side of the neck are grown and on the males, they may be erected during the courtship display. Combs become enlarged during the breeding season becoming a prominent feature on the males head during courtship and battles with other males. Additionally, the males utilize an orange colored air sac to produce the booming “song”. The air sacs are actually esophageal in origin - as the photoperiodism increases in the spring these are enlarged due to hormone releases until reaching maximum size and flexibility around very late March and early April ( at most latitudes) The colors deepen and in some males a magenta coloration may occur on part of the air sacs. 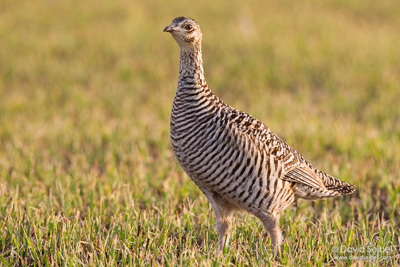 In Greater Prairie Chickens, the deep and far carrying booming song can be heard up to 2-3 miles away, and unlike many other birds - the call is produced on the inhale. Tail: Tail feathers are a solid, deep brown- almost black. upper and undertail coverts are barred. Secretive and stealthy most of the year, The males become very active and visible while engaged in courtship displays each spring. Females remain stealthy and very aware year round. For only a very short period during the year, the males actually do not attend the display areas known specifically in this species as Booming Grounds. In the spring of the year, after the increasing daylight length stimulates physiological changes particularly to the air-sacs which enlarge and gain flexibility, the sounds of the booming are dramatically enhanced. January males even though they are on the same display locations, can not produce any noticeable boom. Air sacs have not enlarged sufficiently to produce the booming 3 note call. Fighting is also at a minimum. In the southern parts of the range, by February, daylight length is increasing and the effects are seen physiologically and behaviorally as well. In central Kansas, peak of the courtship occurs in the first 15 days of April with maximum number of females arriving on average about the 11th depending on weather. This also correlates with the peak of the burning of over one Million acres of native grassland in the Flint Hills region. Females on eggs frequently lose the nest and experience maximum exposure to predation as most of the cover is removed. Any surviving nests are along water courses or other narrow bands of cover and are easily found by passing skunks, raccoons, foxes or coyotes. Reasons for historical decline: Intense market hunting led to the first declines in most areas especially Illinois, Iowa and northern Missouri. Then as conversion of prairies to crops reached a tipping point, the populations were no longer able to sustain themselves. Hunting is not a serious threat today. 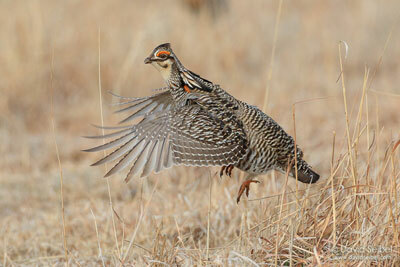 Small numbers of upland game hunters are not alone sufficient to threaten the populations. Habitat is the key issue. Habitat threats include: Over-grazing, over-burning, plowing of native grasslands, spraying of native grasslands to eliminate wildflowers and other native forbs, and any plowing of native prairies. Prairie Restoration - This author would like to point out the work of the Illinois chapter of The Nature Conservancy near Franklin Grove, in Lee Co. (9 miles East of Dixon,IL). The Nachusa Grasslands is a model of restoration which anyone seeking to restore the full beauty of our tallgrass prairies would be wise to study. Any virgin native grasslands within the tall grass region should be immediately prioritized as extremely valuable land. It is hoped that families would understand this and protect with Conservation easements or perhaps talk with a land trust or public agency. Many resources are listed in the What’s Next section of this website. Haying of CRP grasslands should be allowed on 1/3 of the land each year, thus establishing a 3 year rotation and ideal grass heights for each need of both prairie chickens and all the species. Soils are created by prairies and build up over 1,000 years. To combat the highly erosive practices of our intensive modern agriculture, long term strategies are needed. Let’s make prairies a big part of that. 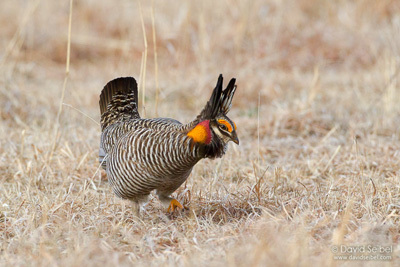 T. c. attwateri- Attwater’s Prairie Chicken is today highly endangered. The subspecies was once found from Louisiana westward along the Texas coast. Restricted to the formerly widespread coastal prairies, Attwaters merged with Greater subspecies in central Texas, where it occurred in the millions. T.c. 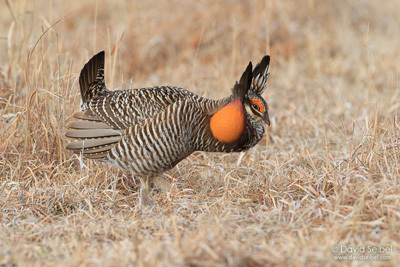 pinneatus- this is the only relatively common prairie chicken found in the central midwest north into Minnesota, North Dakota, east to Illinois and Missouri and west into Colorado, western Nebraska & Kansas, Oklahoma, formerly more widespread and much more abundant. All photos are courtesy of David Seibel and may not be reproduced without express written permission of the photographer. All Rights Reserved. Download this information as a printable PDF.